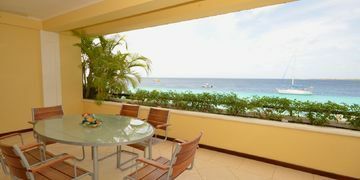 Elegancia del Caribe 14 is located on the 3rd floor, as a middle unit of the North building. A Mediterranean atmosphere dominates the furnishing, with a lot of white with blue and red decorations. 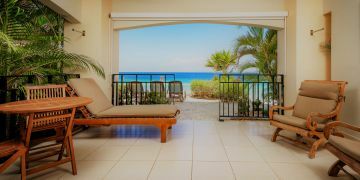 The spacious covered, semi-circle terrace, accessible using French doors from the living room, offers panoramic views over the better part of the bay of Bonaire and the Caribbean Sea. You can watch sail boats passing by at day time and while enjoying your tropical drink in the evening you can make plans for the next day. The lay out of this condo shows the two bedrooms (with their bathrooms) on either side of the hallway. The master bedroom has a comfy king size bed and a private bathroom (double sink, shower and toilet). The second bedroom has a queen size bed that can be converted into two twins. The second bathroom (single sink, shower & toilet) is accessible from both the second bedroom as well as the hallway. There are high quality 100% cotton sheets and fluffy pillows for that much needed comfort at night. Plenty of towels and beach towels can be found in the closets. Both bedrooms have air conditioning and ceiling fans. This condo has screens except for its outdoor terrace. Perfect location, superb view. Highly recommended. Dit appartement op deze locatie gaf ons een gevoel van thuiskomen en totale relaxtheid. Van begin tot het einde van de vakantie hebben we het gevoel dat we in de watten zijn gelegd. Het schoonmaken is heel goed en alles wordt op tijd bijgevuld. Wat mist in het appartement is extra vuilniszakken. Na het meenemen van de vaatdoeken werden ze niet vervangen. Dit zijn kleine dingen die ons niet belemmerd hebben. Hartelijk dank voor uw feedback en het delen van uw positieve ervaring. Wij zullen in de toekomst zorgen voor voldoende vuilniszakken en vaatdoeken.